Most businesses today are using email as their main channel of communication with their prospects and customers, and many of them have done so for years. Email has been tried, tested and proven to work, and it has reached mass adoption today. But what about text messages? As mobile becomes the preferred device for consumers, text messaging is taking over the lead as the most effective outlet for businesses to connect with their customers. Sending peer-to-peer, mass text messages is now possible, and the smart businesses adopting this communication channel are building stronger relationships with their customers and breezing by their competition. Contrary to popular belief, 78% of today’s consumers wish they could receive text messages from businesses. If that is the case, then why are businesses not texting their customers? In this blog, I’ll give you five reasons why text messages perform better than traditional emails and why your business should integrate both into your overall digital and mobile strategy. In a world where ease-of-access and speed are major priorities, text messaging delivers instant gratification that cannot be matched by any other communication channel. With over four billion mobile devices worldwide, businesses can instantly reach just about anyone with a simple text. The possibilities are limitless. Today’s consumers take action when presented with scarcity and urgency, which is why SMS text messaging is a company’s best choice. Although email provides instant delivery, the customer gratification is not instant. With that said, email should still hold a place in your marketing strategy, as it is a viable channel for longer content that provides more detail and doesn’t require a quick response. Business messaging should be almost identical to texting a friend - brief, simple, and to-the-point. With a little creativity, you’ll be surprised how much information can be conveyed in 160 characters without the overuse of abbreviated words. Remember, these messages should not be sent to anyone who needs an explanation of what your business is and the services you provide. Text messaging sees the most success with consumers that are already familiar with your business and what you offer. In order to attract interest and engagement, it’s imperative to be conversational and get creative with exclusive offers. If you wish to tell a complete story and include more detailed offer terms and conditions, then an email may be appropriate, but only if your deadline is not quickly approaching. Is the clock ticking on a 48-hour deadline? Send that text message instead! Have you ever left a text message unread in your Messages app inbox? I didn’t think so. 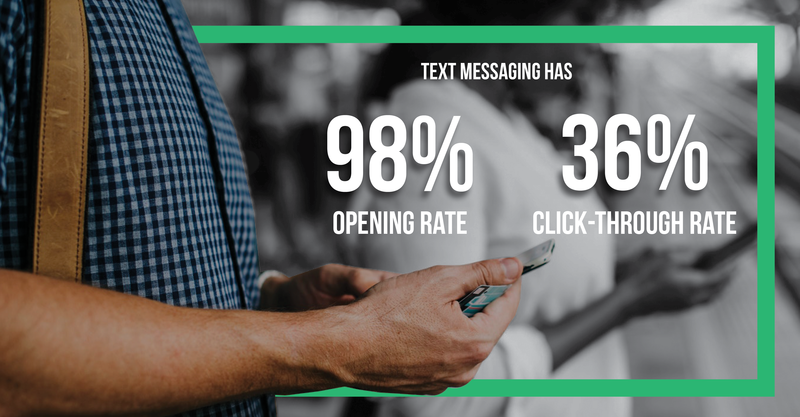 Text messages boast an impressive open rate of 98%+ and click-through rates of 36%, on average. With simple math, you can easily see the opportunity for an exceptional ROI. Currently, traditional email open rates average between 20-25% and CTR’s are 2-3%, depending on the industry. The use of both email and text messaging allows businesses to push two impressions with the same messaging to their customers. Early adopters of ReplyBuy’s peer-to-peer messaging platform have already seen 40%+ engagement rates. That’s pure proof that text messaging paves a path to stronger and more genuine relationships with customers. When email became a mainstream communication channel, regulations ramped up and there was a major crackdown. Due to the progressively noisy and cluttered inboxes, email service providers were forced to come up with creative solutions. Segmented inboxes, spam filters, permissions, consent, privacy and junk folders are only a few of the many solutions that stemmed from this email epidemic. 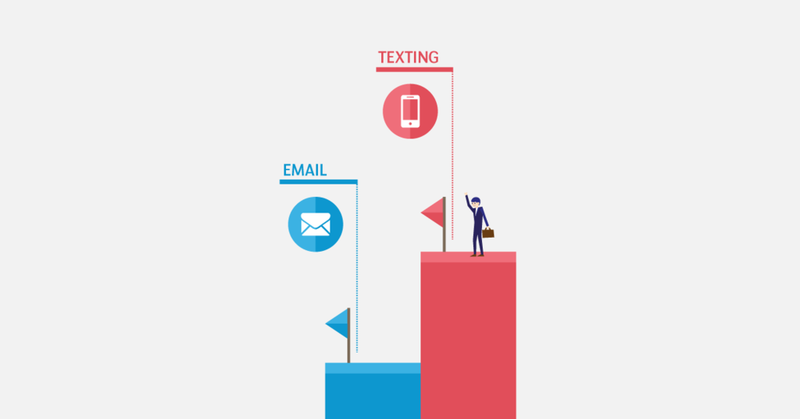 Although text messaging has its own regulations enforced by the TCPA, compared to email, it is by far easier to cut through the noise and reach consumers. There are best practices for text messaging that will help you stay compliant at all times, while still yielding the full benefits of this communication channel. Better together - that should be a mantra of life. Integrating text messaging and email into your overall digital and mobile strategy is not just better, it works like a charm. With the introduction of business texting, you do not have to phase out email completely. Use them to complement one another. For example, you could utilize each channel individually to merge your audiences. Send an email campaign with an offer that requires a mobile opt-in to be redeemed. Promote exclusive offers in each channel independently to incentivize an opt-in on both. Customers haven’t opted-in on mobile? Then they are missing out on exclusive flash deals. You can also text your customers to spark an interest in your product or service, or use text messages to initiate a conversation, and then take it to a phone call to close more deals. Want to provide an exceptional customer experience so that your business performs better than the rest? Follow-up with email for longer form solutions, and then close the ticket with a brief text message directly to your customer. Talk about world-class service! There’s no doubt text messaging is here to stay, and there hasn’t been a better time for businesses to start leveraging this untapped communication channel to foster stronger relationships with their customers. Don’t ditch email, rather learn to embrace it the right way and see it as a complement to text messaging. Utilize email and text messaging strategically, and you will boast an overall higher audience engagement. Do you need help engaging your audience? Let us help you! Today, ReplyBuy is enabling hundreds of businesses to have more meaningful conversations with their customers using text messages. You could be one of those businesses! Learn more and get started with ReplyBuy today.